President Donald Trump on Friday issued a statement addressed to Prime Minister Nikol Pashinyan congratulating the people of Armenia the 27th anniversary of Independence. Below is the text of the statement. On behalf of the people of the USA I congratulate you and the people of Armenia on the occasion of the 27th anniversary of independence. This year Armenia has various reasons for celebration. 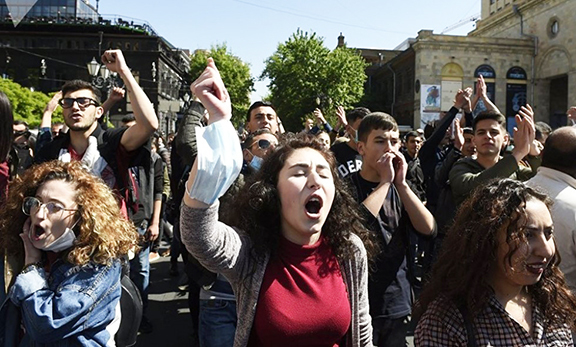 The peaceful, popular movement brought a new era in Armenia and we are ready to work with you to help to bring into life the will of your people to eradicate corruption, to establish representative and accountable administration based on independent judiciary, political and economic competition. We thank you for your resolve partnership on various platforms, particularly your participation in NATO activities and for generously accepting Syrian refugees. In the upcoming months opportunities will emerge for the settlement of Nagorno Karabakh conflict, which can open new opportunities for the Armenian-American partnership. As a member of the OSCE Minsk Group, the USA is ready to work with you for finding a lasting and peaceful settlement to the conflict. Thank you, Mr. Trump, In a short and meaningful message you touched so many important issues for Armenian People. Please continue your amicable statements and feelings towards Armenia and the Armenian People throughout the World. How about OUR AMENIAN GENOCIDE ,over ONE and HALF MILLION ARMENIANS SAINTS were MURDERED . Hope this partnership doesnt sour to soon . Great words listening from the president of the U.S.A for such a blessed country that always does its best to stay remarkable. But he failed again (in this occstion) to mainshen the Armenian GENOSIDE.